OBDII adapters have been around for a while. You simply attach it to the OBDII (aka OBD2) diagnostic connector of your car to get data such as engine’s RPM, vehicle’s speed, and failure logs over Bluetooth or USB onto your smartphone with apps such as Torque Lite. 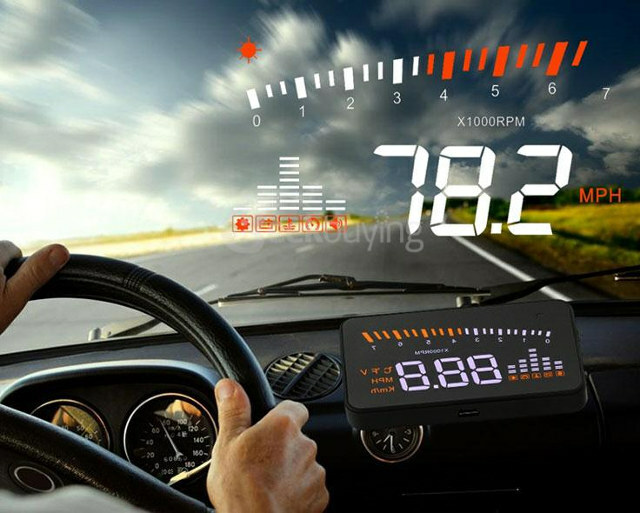 X5 ODB-II head up display uses the same technology but instead of displaying data your mobile’s screen, it shows it on the windscreen. The device comes with an OBD-II Cable, and anti-skid mat, and a reflective film to work around a double reflection issue with some windscreens. I found X5 in GeekBuying’s newsletter, where it sells for $38.99, but it’s not the only model, as the company also sells X6 and Q7 models, for respectively $43.09 and $61.99, with the latter featuring a larger 5.5″ display. I wondered how well the display would reflect on the windscreen, so I looked for reviews, and one person did a very nice review with A8 OBD2 HUD which he bought on GearBest for $42.89, which appears to be a better deal, as the device features a 5.5″ display. The video starts with an unboxing, but if you want to check the display functions and setup menu jump around the 4:30 mark, while the double reflection issue is shown at 9:30, and the actual test after installation is complete starts at 11:30. It looks better than expected at night and under shadow, but it’s certainly a bit washed out under a strong sun. Should have been with a wireless OBDII dongle and battery driven HUD display. Doubt many people will want a cable going from a box on the dashboard to the OBDII port which is usually somewhere under the steering weel. I’ve tried a few different OBD2 connectors (BlueTooth, USB) on different cars, but none worked. So … I would like to use OBD2, but so far I’ve only thrown away my money. I haven’t had any luck with two Bluetooth adapters either. I wonder if they disable it in some cars, or there are some variations of the standard.